Field teachers and researchers of forest ecology and professionals in forest ecology in both public and private arenas share their expertise. This revised edition emphasizes an earth science perspective as well as that of forest biology. 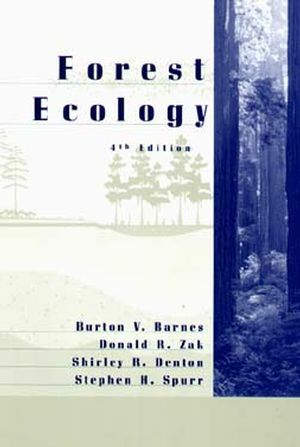 Burton V. Barnes and Donald R. Zak are the authors of Forest Ecology, 4th Edition, published by Wiley. ECOSYSTEMS AT MULTIPLE SPATIAL AND TEMPORAL SCALES. Landscape Ecosystems at Multiple Spatial Scales. Long-Term Ecosystem and Vegetation Change. Site Quality and Ecosystem Evaluation. Carbon Balance of Trees and Ecosystems. Scientific Names of Trees and Shrubs.